IIT Bombay Recruitment total vacancies are: 17 posts. 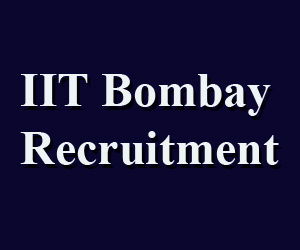 IIT Bombay Recruitment- Junior Mechanic: 08 posts. IIT Bombay Recruitment- Junior Laboratory Assistant: 03 posts. IIT Bombay Recruitment- Junior Technician: 02 posts. IIT Bombay Recruitment- Assistant Security Inspector: 04 posts. Jr. Mechanic: Diploma in Electrical/ Electrical & Electronics Engineering discipline (03 years) with 2 years relevant experience or ITI in Power Electric Systems trade/ Electronics Mechanic Trade with 5 years relevant experience or Bachelor’s degree in Electrical/ Electrical & Electronics Engineering. Jr Laboratory Assistant: Diploma/ Bachelor’s Degree in Civil/ Mechanical Engineering Discipline or ITI in Machinist trade. Please see the IITB Notification for qualification details. IIT Bombay Recruitment : Age of the candidate for IITB vacancies is 27 years. IIT Bombay Recruitment : See the notification for age relaxation details. IITB will conduct Screening Test/ Trade Test/ Physical Test & Computer Proficiency Test for shortlisting candidates depending on the nature of posts. Final Selection will be made on the basis of marks obtained in written test. Qualifying marks for general candidates is 60% and 55% for reserved candidates. Selected candidates have to undergo Medical Test as per the requirements of the IIT. Candidates full fill prescribed qualifications/ experience may apply for these vacancies through online. Applications available @ www.iitb.ac.in. Prescribed application with photograph, signature and other necessary certificates before last date. Closing date for online application submissions is 07/August/2017. IIT Bombay Recruitment : Application fee for each post is Rs. 50/- paid through online. IIT Bombay Recruitment : No application fee for SC/ ST/ PwD and Woman candidates.